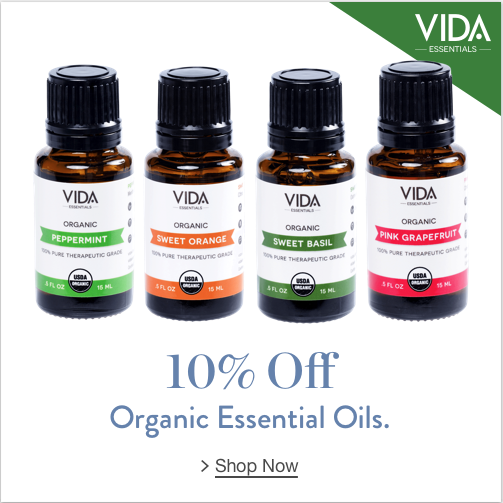 We mention quite a bit on our website that it is wise to dilute essential oils, but many people don’t actually know how to dilute essential oils. Here we have a guide to diluting oils to use topically, as sprays, and in diffusers. Please keep in mind that these percentages and recommendations are just suggestions, and you should absolutely tune into your own body and consult a medical professional for further advice. At the bottom, we have a few of our favorite carrier oils and diffusers! Below is a chart which shows how to mix essential oils into a carrier oil or water. There are different oils and reasons you may want to use at different strengths, but tend toward lighter use of essential oils. This way, you can see if your body agrees with the oil before overdoing it! – This is a great place to start for infants and those under two years of age. It’s also especially recommended for oils which may be considered “hot.” This includes oils like cinnamon, clove, oregano, black pepper, and ginger. – Use 1% for toddlers and young children with any oil. This may also be ideal for people who are sick and the elderly. If you’re using an essential oil daily on the skin, this may be where you want to stay as well. – If you’re using an oil sometimes but not regularly, this may be a good place for you if you’ve found no irritation from the oil. Watch out for hot oils and make sure to test them before applying anywhere too sensitive! – Using this heavy of a dilution is not generally recommended for regular use. Heavier dilutions like this should perhaps only be used in short-term applications and sprays. One of the main reasons you may want to dilute your essential oils is to use them topically. When using an essential oil topically, it is generally not advised to apply it “neat,” or without dilution. Many oils can cause skin irritation if applied neat, so it’s important to dilute the oil first. Furthermore, you can make your own blends when diluting oils. There are blends you can buy that are already diluted, such as doTERRA Balance. The carrier oil used to dilute the oil may be a number of different options. The most common carrier oil used is fractionated coconut oil, while almond oil, olive oil, and jojoba oil are often also used. When making an essential oil dilution for topical use, you should test the oil to see how your skin reacts. We recommend first testing the dilution on the bottom of the foot. If there is no tingling, itchiness, or swelling, you may try it elsewhere. This is just a step to take to make sure you don’t apply an oil you’re sensitive to directly to a dangerous area such as the face, neck, or chest. You also may want to make a dilution to diffuse in the room during your day, as we often do during meditation. In a diffuser, water is used instead of a carrier oil. The general suggestion is that you should use 3-5 drops of essential oil per 100 mL of water. However, you must test for yourself to see what works. Keep in mind that some oils may irritate you more than others, so always be careful before diffusing oils. Test with a few drops, and you can always add one or two more if you need. It’s better to be safe than sorry, and even a few drops of essential oils can bring great benefit! If you wish to make and essential oil spray or spritzer, you again must use water. Every oil is different, but you’ll want to use 2-3 drops per tablespoon of water. Depending on the essential oil use and what you want to do with it, you may want to use less. When making a spray, you must remember that oil and water do not mix! You must shake it well before and during use, or you’re just going to end up with water coming out. Some people recommend adding a teaspoon or two of vodka to help break down the oil into the water as well. First, when making an essential oil dilution, always err on the side of caution. Use less, remembering that you can always add an extra drop of your oil down the road. Some essential oils will irritate the skin, so keep yourself safe! Second, make sure the oil can be used topically. Make sure to read the label and instructions thoroughly. If you’re not sure, ask a professional. Some oils are meant for a specific use and should not be used topically. Finally, always test your mixture out first! Don’t make a dilution for the first time and apply it directly to your face. Instead, test it out, let it sit a while, and see how your body reacts. This takes some patience and mindfulness, but can help prevent quite a bit of discomfort. Below are a few options for diffusers, carrier oils, and supplies to make your own dilutions. These include bottles, droppers, and rollerballs. Check them out below!